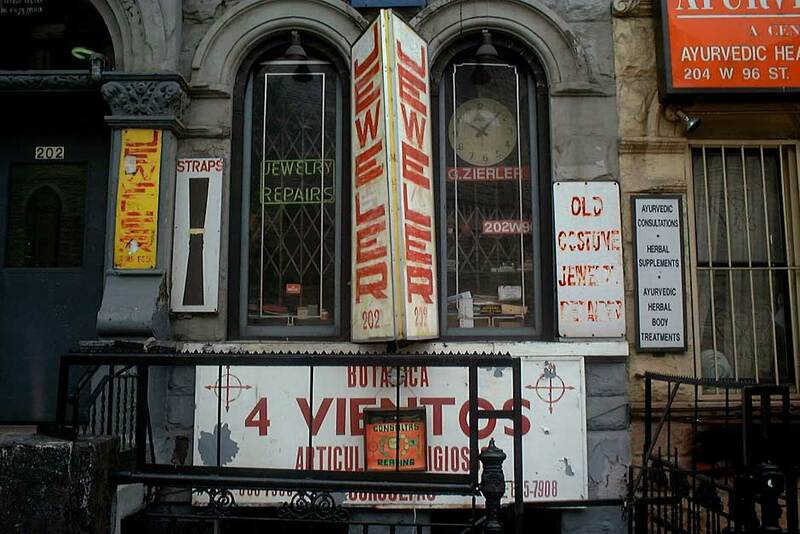 G. Zierler, Jeweler, was located here on W. 96th St., near Amsterdam Ave. from 1959 to 2004. Proprietor was Gerard Zierler (1930-2007). He was born 24 January 1930 and died 5 November 2007. I have not been able to determine where he was born, probably Germany. The ship's manifest of the S. S. Brazil arriving from Buenos Aires, Argentina, 24 November 1952, listed him as Gerd Dieter Zierler, age 22, "stateless German." An article in the New York Times, 30 July 1983, said that Zierler "learned his trade in Argentina." Another Times article, 21 February 1991, said, "Mr. Zierler repairs costume jewelry ... In business on the Upper West Side since 1959, he also repairs fine jewelry and watches." This view shows Est. 1959 above Zierler's Jeweler sign. A notice in the Times, 7 November 2007, read, "Zierler - Gerard. Upper West Side Old World Jeweler, chess player, Judaica lover, great wit. You will be missed."